Set against the backdrop of the gritty streets of London and Marbellaâ€™s hedonistic glamour on Spainâ€™s seductive Costa Del Sol, Gunned Down is billed as an uber violent stylish revenge thriller along the lines of â€œPOINT BLANKâ€ meets â€œHEATâ€. Boom! 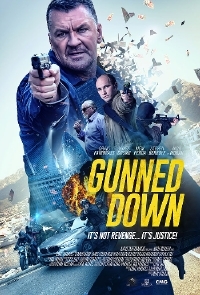 Gunned Down is directed by Mark McQueen (Devilâ€™s Playground) and Stars Craig Fairbrass (Rise of the Footsoldier, The Outsider), Mem Ferda (Devil's Double, Pusher), Nick Moran (Lock, Stock, and Two Smoking Barrels) mong others. Jack Cregan, career criminal, family man and vicious armed robber, is on a mission for revenge. When Jackâ€™s father Alfie Cregan is brutally murdered and their money from the Heathrow airport heist stolen, Jack, his cousin Sammy and other gang members Eddie and Frank, realize there is more to the stolen money and Alfieâ€™s murder than meets the eye and once Jack begins to dig, he knows that his life will never be the same again. The shattering revelations that follow force Jack, with the clock ticking, to not only pull off one dangerous last robbery, but also to exact brutal revenge on all those involved. More on the release of Gunned Down as it comes, folks! Can't see the trailer? Watch it here. also, its a crime thriller, why it is on this site? Is it Mem Ferda's PR people again?